In 1998 and 1999 I traveled to Madras, India, to study the principles of Vastu Science as applied to Architecture. Through my work and research, I had become aware of this tradition of sacred Architecture which employed basic principles of the laws of nature to promote the health and happiness of the people who lived these special buildings. In previous years, I had been commissioned to design two buildings that conformed to what my clients called "Sthapatya Vedic" Architecture. They requested that I work directly under the guidance of a designer in Europe. I was directed by this designer to create a floor plan and elevation following certain basic principles of room placement and then send it to him for review. The process of design and review went on for several weeks until we had arrived at a building that conformed to the room placements and included very precise, if odd, numbered dimensions for the plan and elevations. I was instructed to insist that the dimensions be held with integrity as the building was erected, down to the 1/8th of an inch. I was very interested in understanding the principles of design and the philosophy behind the design and I requested more information from the Sthapatya Vedic expert. To my great disappointment, he communicated to me that he wasn�t at liberty to convey the information that I wanted. I began a search for information about Sthapatya Vedic Architecture. I found that there were several volumes of ancient Indian literature, as well as modern, dedicated to the subject. When I surveyed the books I found them quite confusing. I realized that I needed to find a teacher. I attended a weekend seminar on the subject given by a designer from India, but again, the actual nuts and bolts information was not made available. Finally, I found an architect in India who was supposed to be an expert of the tradition of knowledge. I had attended a performance of Indian sacred dance one evening and in the introduction to the performance the dancer told us that she had danced at a conference on Sthapatya Vedic Architecture in Southern India. After the performance, I asked the dancer if she could recommend me to an expert architect in the tradition. She eagerly gave me the name of Dr. V. Ganapati Sthapati of Madras, India. I called the Sthapati (meaning: expert sculptor and building designer) the next day and he told me that he was building a temple in the Midwest and would be visiting the site within a week. I made arrangements to meet with him when he came to the USA. Ganapati Sthapati was born in 1927 into a family whose ancestors built the great temple at Tanjore in the 10th century. He learned his craft from his father and uncle. Starting out as a sculptor�s apprentice, growing to become a master sculptor and a temple designer. 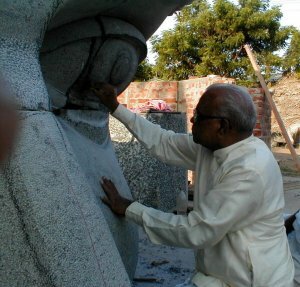 He spent 27 years as head of the Government College of Architecture and Sculpture in Mahabalipuram, Tamil Nadu. He is responsible for India�s significant resurgence in the ancient art of stone carving. After his retirement in 1988, he continued building temples and founded the Vastu Vedic Research Foundation to explore the ancient origins of temple craftsmen. As I was ushered into meet Sthapati I noticed that the Indian workers that were building the temple treated the man with utmost respect. Our interview lasted about one hour. I showed him my house designs and he chuckled as he critiqued them. He said that architecture was frozen music and that a building could be an expression of pleasant and powerful harmonies. He made sketches on my drawings, mentioning something called a "Vastu Purusha Mandala". He spoke of the possibility of a building being a coherence generator, tuning the occupants to the laws of the universe and increasing health, wealth and spiritual well being. He said that a building was a living organism, like the human nervous system, and could be designed in "harmonic resonance" with the basic underlying energy structure of the universe. But more than his words, his presence, his confidence, his enthusiasm and love of his art, told me that he was a man who lived his Truth. At the end of our meeting I asked him if I could come to India and study with him, he seemed a bit surprised actually, but he welcomed me to come. Ganapati Sthapati holds that the historical figure, Mayan, an architect and town planner of ancient India was the source of "Vastu Science". He was the author of Mayamata Vastu Shastra (a treatise on building and architecture) and also Surya Siddhanta (a treatise on Astronomy). These works are still alive and being used by scholars and practitioners all over India. Sthapati told me that Mayan was adored as "Viswakarma" by Veda Vyasa in his Mahabharata (one of India�s most renowned scriptures), implying thereby that Mayan was aware of the dynamics of SPACE and was able to apply the space-mechanics to his own creations and transform them into little universes on the Earth. Whatever he was able to create in visual terms, be it a sculpture, building or a town or city layout, they behaved like living organisms and pulsated with life. He was a great scientist of India who identified and quantified the vibrancy of the space enveloping the Earth and the heavenly bodies and also dwelling in each of the objects of nature. The plan of the layout of a temple or a residential building is technically called Vastu Purusha Mandala with a grid of 8 x 8 = 64 spaces or 9 x 9 = 81 spaces of equal dimensions. In modern architectural terminology this can be addressed as an energy grid. These layouts are squares, two dimensionally, and cubes, tridimensionally. Those two layouts are the geometrical formulae for the shilpi (sculptor or architect) to replicate the subtle substance of the universe into visual material form. This is the formula handled by God Viswarkarma, the creator of the universe, to turn his own thoughts into material forms. This formula is couched in a simplistic saying: Vastu reva Vaastu� meaning it is subtle that turns into gross�. Here Vastu is subtle energy and Vaastu is embodied energy. This was discovered and put into the Vaastu texts by Mayan. In Sthapati�s words: "What is amazing to be remembered in this context is that they (forms produced by the application of Vaastu Science) are the forms (geometrical patterns) of the Spirit, reproduced in its own time-scale. They are the replicas of the subtle forms experienced at heart. They are living organisms that resonate with the Supreme Reality." There are many factors at work in the creation of a building aligned with principles of Vastu Science. There are ancient texts with thousands of pages that dictate in detail the design necessities of buildings in general as well as specifics. For example in one text, the Mayamata, some of the chapter headings are as follows: Dwelling sites, Examination of the Site, Taking possession of the Site, System of measurements, Orientation, Offerings, Towns, Number of Stories and the Dimensions, The Foundation Deposit, The Base, Dimensions of Pillars and Choice of Materials, Entablature, Joinery. My experience was that to digest, assimilate and apply the information in these texts was a discouraging chore. I began studies with Ganapati Sthapati hoping that he would act as and interpreter and filter of the knowledge for me and this he did. I came away from my studies with a balanced and applicable body of knowledge. Building Layout with regard to a grid called "Vastu Purusha Mandala"
The selection of a building site is a very important factor in Vastu Architecture. The Earth is considered a living organism in Vastu Science. Sthapati says, "The Vastu Shastras address this energy contained in the Earth as Vaastu Purusha�. Purusha means subtle energy that permeates the Earth and Vaastu� is the material body that evolved out of the energy... In abstraction, Purusha  is but a subtle substance: Vastu� (or essence of the subtle universe) which means universal consciousness� or awareness�. Earth is...a live material object suspended in (a sea) of space and existing as apart ... of the Universal Being. " The general slope the site is very important. Sloping down to the East, North East or North is considered to be beneficial with the opposite having negative effects for the occupants of the structure. From my research, this seems to have something to do with the flow of water over and under the site. Also, the position of water on the site or in relationship to the site is considered: Northeast being the best location for a body of water. Fencing a plot with acceptable proportions is also important. It is because when vast land is limited by boundary lines it takes a form. That is, formless takes a form. Of utmost importance is the orientation of the structure with respect to the cardinal points of the compass. According to Vastu Science, a network of energy lines covers the globe of the Earth: an energy grid. These lines are very similar to what we know as the longitude and latitude lines. The lines are conduits by which the energy concentrated at the center of the vital Earth flows out and spreads over the Earth. They are also lines of absorption of solar, lunar and stellar energies. The Earth pulsates with life and rays its energy through this grid system. Vastu Science relates that all planets are suspended or soaked in the ocean of space, which is the source of energy that sustains all embodied energies including man and other animate beings that live on the Earth. The concept of the energy grid has been the ruling element of Vastu science in the domain of traditional designs pertaining to Indian architecture. The building plan is laid out with respect to an energy grid called the "Vastu Purusha Mandala". One typical grid is 9 x 9, but there are many other traditional grid forms consisting of odd and even numbers. This grid can be made of squares or rectangles. When the grid plan of the structure is oriented to the cardinal points of the compass it is said to lie exactly over the earthly energy grid. (Establishing of the building grid in exact relationship to the cardinal points of the compass applies to temples. For secular structures it is best to rotate the structure about one degree to the north of true East.) Once the designer establishes the grid, he can lay out the walls and pillars of the building on this pattern. Sthapati says, "This establishes a kind of geometric congruency or harmony with the earthly grid. If the structure�s grid is in harmony with the Earth�s grid, then the built space and the Earth respond harmoniously energetically. If there is any distortion, deviation or deflection in the grid lines of the proposed building grid and that of the Earth�s grid, then the built space is said to be in disharmony with the Earth�s energy grid system." Vastu science holds that we are wedded to the Earth and constantly exposed to the energy fuming out of it. To be in harmony with this energy is the goal. Again Sthapati: "Just as we, human beings, harbor in our heart an atom of Divine energy by which we are able to vibrate with life...the Earth also vibrates from within sending forth energy waves." The Vastu designer brings about harmony between the vibrations by implementing particular a mathematical order called Ayadi. The knowledge of Ayadi is used by the designer to determine the effects of the physical structure on the individual. The homeowner is born under the influence of a particular birth star. The building is considered to be a living being and also has a birth star. Ayadi calculations attempt to harmonize the energies created by the influence of the birth star of the person and that of the building. When these energies are harmonized the dweller experiences material prosperity and spiritual well being. Ayadi is also said to be able to effect the fate of the individual. 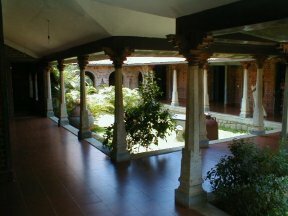 Another significant element in a Vastu residence is the Brahamastan or central courtyard. In a grid of 9 x 9 it is the center nine units. It is the energy heart of the house. It is the lung of the house. This part of the house should always be left open and free of obstructing elements (pillars or walls) and mechanical services. It is best if this portion, at least, is directly in contact with the Earth. It is traditional, where climate permits, to leave the Brahmastan open to the sky so that the energetic space surrounding the Earth is attracted into the house. This provides the inmates of the house with beneficial spiritual energy. When there is a roof over the Brahmastan then there should be a natural light source, a skylight or cupola with windows, at the roof. Also, if possible, a small vertical passage can be provided at the apex of the center. Room location in the building is an important factor in Vaastu architecture The location of a particular room defined by function is determined by respecting the particular element that rules that area of the building. All these principles (and more) taken together give the architect a design matrix for creating buildings that live and vibrate harmoniously with universal energies. I have found them easy and pleasing to use. I am convinced that this information is worth study and application by anyone interested in understanding the significance and full potential of sheltering the human nervous system.